Hanukkah! – Merry Christmas, Columbia! The 8-day Festival of Lights starts early this year! From December 2-10, Columbia will be alight with the glow of the menorah. Although it is not a massive occasion, there are still many events going on around town to commemorate this exciting holiday! Hanukkah is a Jewish holiday which celebrates the miracle of the candles that burned for eight days. When the Maccabees- a group of rebels fighting against the tyrannical rule of Antiochus, head of the Seleucid monarchy- were forced to take refuge in an old temple, they found themselves dangerously short of supplies. With only enough candle oil to provide a day’s-worth of light, the Maccabees were in need of a miracle, which came when the candles burned for eight days straight. This amazing act not only bought them enough time to secure more oil, but also proved that their God was fighting this battle with them. With renewed strength and belief, the Maccabees went on to overthrow Antiochus’ regime, and restore peace to their city of Judea. Our organization is called Chabad, and the primary objective of our branch (Chabad at USC) is to be resource for the Jewish students at the university and to support and grow Jewish life at USC in any way we can. The Dec. 2nd event is both a religious holiday observance (it is the first night of the festival of Hanukkah) and it is also the official Grand opening of our Center for Jewish Student Life. Join the Jewish Community Center at sundown for a ceremonial lighting of the menorah! This free event is open to members and non-members alike, and will take place every night of Hanukkah. Whether you are Jewish, or simply interested in the cultures surrounding other religions, this will be an informative, comfortable, and communal event. The annual celebration of the first night of Hanukkah will take place at the Isadore E. Lourie Memorial Menorah in front of the South Carolina State House. This FREE event will feature live music, traditional Jewish foods like latkes, and much more. Don’t miss out on your chance to commemorate the beginning of this holiday with your community. Potato latkes are a Hanukkah staple! These fried “potato pancakes” are great for the whole family, and take no time to prepare! Though they are traditionally served with applesauce, try them with sour cream for a unique twist! 1. In a food processor grate the potatoes. Line a sieve with cheesecloth and transfer potatoes to the sieve. Set sieve over a bowl, twist cheesecloth into a pouch, squeezing out some moisture. Let mixture drain for 15 minutes. After 15 minutes, pour off liquid from the bowl but leave the white potato starch that settles in the bottom of the bowl. 2. To that starch add shallots, eggs, flour, 1-1/2 teaspoons of salt and freshly ground pepper. Return drained potatoes to this mixture and toss to combine. 3. Preheat oven to 200 degrees. Line a baking pan with paper towels. When you are ready to eat, in a large skillet heat 1/4 inch of oil over medium high heat until hot. Drop heaping tablespoonfuls of potato mixture and cook for 3 to 4 minutes a side; latkes should be golden and crisp on both sides. Eat right away or keep warm in oven. Serve with applesauce or sour cream or cottage cheese mixed with sour cream. Hanukkah and Jelly doughnuts go hand-in-hand, but these fall-themed sufganiots will really impress you! With the amazing flavors of pumpkin and cranberry to spice up your holiday pastries, you might never go back to grape jelly. 1. Place butter in the mixing bowl of a stand mixer. Pour hot milk over butter; stir occasionally until butter melts. Whisk pumpkin puree, 3/4 cup white sugar, eggs, and egg yolk into milk mixture. 2. In separate bowl, combine flour, yeast, salt, ginger, cinnamon, and allspice. Using the paddle attachment, mix in about 4 cups of flour mixture on low speed. Scrape down sides of bowl and underneath paddle. Add remaining flour and mix, scraping down sides, on low speed until fully combined. Dough will be very wet, almost cookie-dough consistency; don’t worry, it will absorb moisture as it sits. 3. Transfer dough to a greased bowl. Cover bowl with plastic wrap lightly coated with cooking spray. Refrigerate for at least 5 hours or overnight. 4. Combine canned cranberry sauce with 1/3 cup water in a small saucepan. Break the sauce up slightly with a spoon. Heat, covered, over medium-low heat, stirring occasionally, until cranberry sauce melts, about 25 minutes. Pour into a bowl and refrigerate. 5. Place chilled dough on well-floured work surface. Shape it into a ball, divide the dough in half, and return half the dough to the greased bowl. Cover with greased plastic wrap and refrigerate. Roll out remaining dough half, flouring surface as needed, to 1/4-inch thickness. Cut out dough rounds with a 3-inch cutter. 6. Heat oil in a deep-fryer or large saucepan to 375 degrees F (190 degrees C). Line a baking sheet with parchment paper or a silicone liner. This will prevent the dough from sticking and tearing. 7. Transfer dough rounds to prepared baking sheet in pairs (one will be the top half, the other the bottom half of the doughnut). Gather up remaining dough scraps and add them to the dough stored in the refrigerator. 8. Whisk egg white with 1 teaspoon water. Brush the rounds that will be the bottom halves of the doughnuts with the beaten egg white. 9. Spoon 1 teaspoon cranberry jelly into center of each bottom round; arrange second round on top and press edges to seal. Let doughnuts rest 20 minutes. 10. Working in batches, fry doughnuts until well browned, about 1 1/2 minutes per side. Drain doughnuts on paper towels. Pour 1/2 cup white sugar into a bag or large bowl; toss doughnuts in sugar to coat. 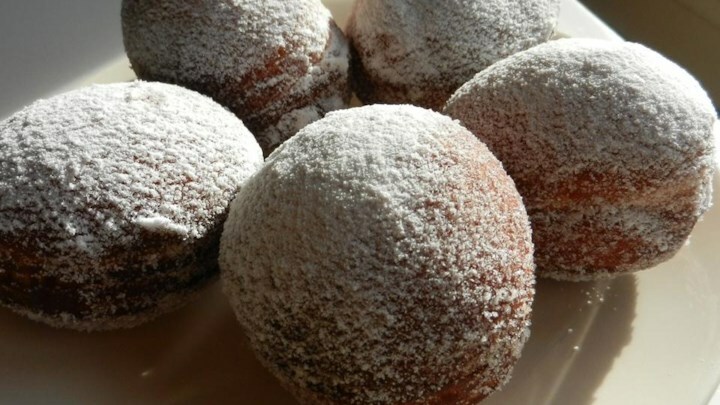 Dust doughnuts with confectioners’ sugar before serving. Repeat with remaining dough.